Calling All Who Bleed Green! Deerfield Academy is an independent secondary school committed to high standards of scholarship, citizenship, and personal responsibility. Through a rigorous liberal arts curriculum, extensive co-curricular program, and supportive residential environment, Deerfield encourages each student to develop an inquisitive and creative mind, sound body, and strong moral character. Set in a historic village bounded by river, hills, and farms, Deerfield inspires reflection, study and play, abiding friendships, and a defining school spirit. A vibrant, ethical community that embraces diversity, the Academy prepares students for leadership in a rapidly changing world that requires global understanding, environmental stewardship, and dedication to service. From November 1-10, make a donation to one of five different projects impacting the Deerfield experience for our current students. 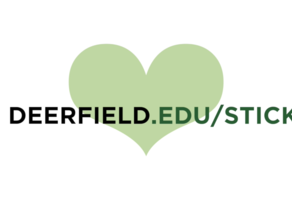 Make an impact at Deerfield Academy! Connect with other Alums on GiveCampus!